Three simple ingredients: potatoes, onion and eggs, turned into a yummy, appealing and always successful dish. 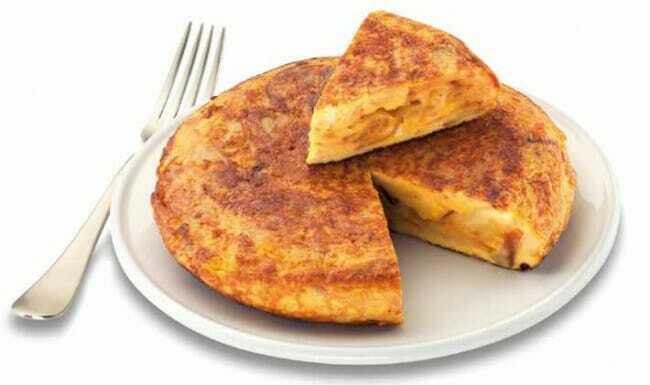 No home across Spain misses a simple Spanish Potato Omelette for lunch or dinner once a week, at least. At the same time, no ‘tapas’ bar o cafeteria refuses to have a nice golden Spanish Potato Omelette, waiting for the customers to order a portion at any time. Ideal for sharing, taking away for lunch at work, school or to a potluck party, for taking away every time you go to enjoy the countryside, for kid’s dinner or just for making it when someone pops up at dinner time and there’s nothing really suitable to cook in a short time, any time can be a pretty good occasion for cooking it. So easy, so lovely… Can be eaten as a ‘tapa’, as a portion or in a ‘bocadillo’. Anyway, it’s delicious itself !!! 2Cut them in THIN & TINY slices. 3Peel and cut the onion, too. 4Heat the oil medium in a frying pan. 5If you want to know if the oil is hot enough, put a small slice of potato. If it bubbles, then you can add all the potatos and onion slices. 7It doesn’t matter if the potatoes exceed the height of the pan, once cooked they reduce almost a third. 8Turn down the temperature, it must be fried, not burnt! 9At the end of the cooking process, turn up the heating, so the potatoes get crispy. 10Remove the potatoes and onion from the pan. 11Strain them so they lose most of the grease. 13Beat heavily the eggs in a deep a bowl and salt them. 14Add the potatoes and onion, already strained. 15Let the mixture settle for 5 or 6 minutes. 16Grease lightly and heat medium a NON-STICK pan. 17When hot, add the mixture. 18Let the mixture thicken slowly. 19Slide the pan slowly back and forth to not let stick the omelette on the pan. 20Turn the omelette onto a plate wide enough to cover the entire pan. 21Once on the plate, place it upside down back on the pan again, in order to seal and thicken slowly the other side too, until it gets a nice golden color. 22When done, place it back on a serving plate. If there’s a short time to make the omelette, cover the pan with a lid while cooking potatoes and onion for 5 min. That way, the potatoes will have a stewed-like preparation. Remove the lid, stir the potatoes and onion and let them fry. They will get tender way quicker.